I didn't start collecting books until 1985. I was 38 years old and serving my last overseas tour in the United States Air Force before retiring. England was a great place to start collecting books. And I had four years to earn my nom de plume of "moibibliomaniac." So yes, I am partial to English bibliophiles, and to their books. And the 1892 Second Edition of Andrew Lang's The Library was one of the first books about books that I ever read. 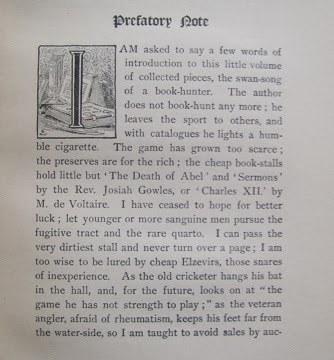 I devoured Lang's advice about book collecting, as did a bookworm who burrowed two tiny holes through the bottom right-hand margin of some of the pages of the book. Most people remember Andrew Lang (1844-1912) as the author of the colorful Fairy book series, twelve books in all, beginning with The Blue Fairy Book in 1889. But he was also a bookman, a scholar, a folklorist, and a poet. 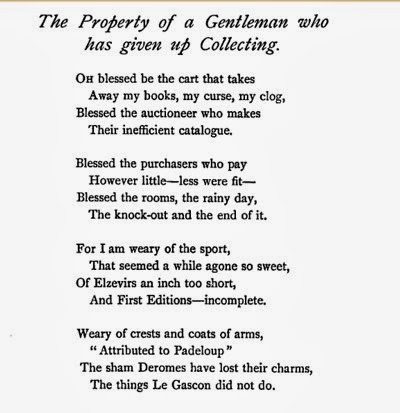 What he was not –– or so I thought –– was a gentleman who had given up collecting. The knock-out and the end of it. The things Le Gascon did not do. That write in prose, or worse, on books. Are older than the dawn of time. Good-night to all your clan, good-night. And kept our old collection! 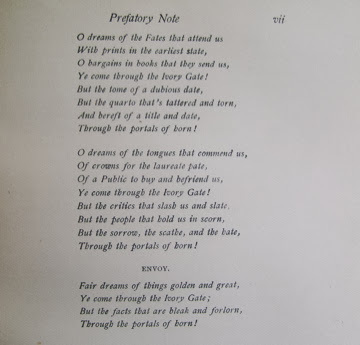 I read this poem from the first volume of The Poetical Works of Andrew Lang, edited by Mrs. Lang and published by Longmans, Green & Co. in 1921. I can relate to this poem because I took steps towards the disposition of my own library after a near-fatal illness last December. And I even wrote about it in my Contemplations of Moibibliomaniac blog last February. 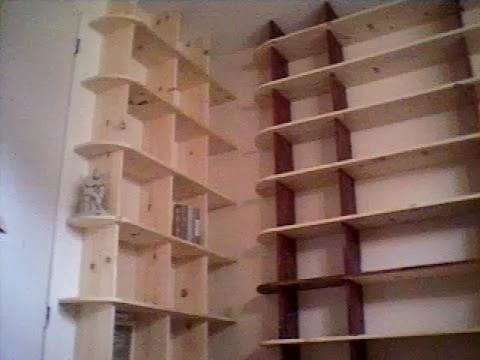 But empty shelves were not for me either. "Once a collector, always a collector." Andrew Lang may have coined that phrase himself. 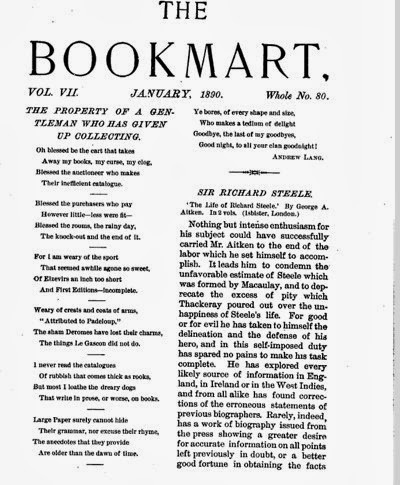 At any rate, he used it in "A Bookman's Purgatory," one of the essays published in his 1886 book, Books And Bookmen. 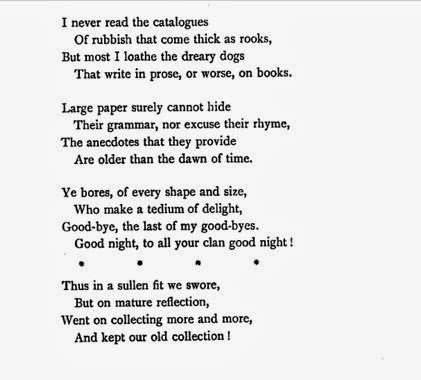 And I believed that he just wrote the poem about not collecting anymore in jest –– that he never really stopped collecting. 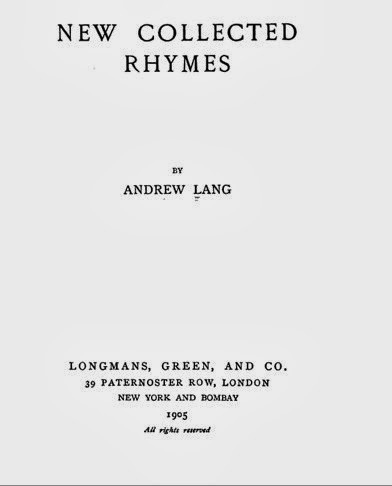 Many of Andrew Lang's poems and essays first appeared in magazines before they were published in books. 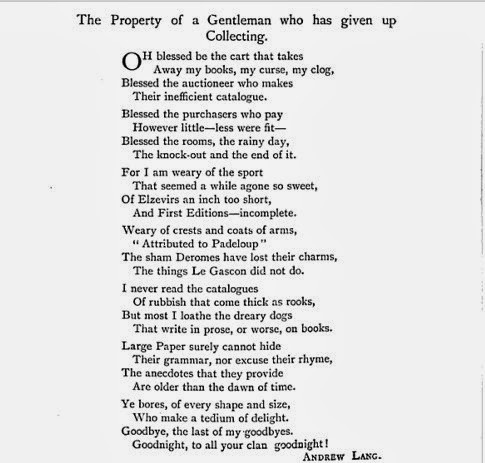 And the poem, "The Property of a Gentleman Who Has Given Up Collecting," was no exception. 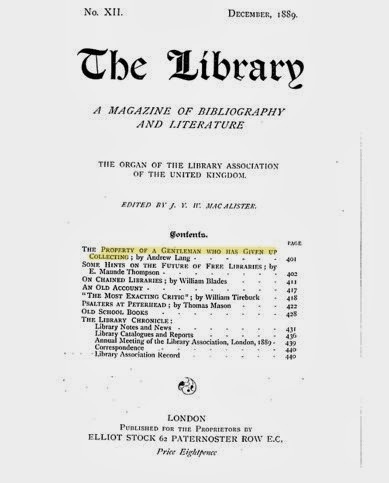 It first appeared in the December 1889 issue of The Library: A Magazine of Bibliography and Literature. 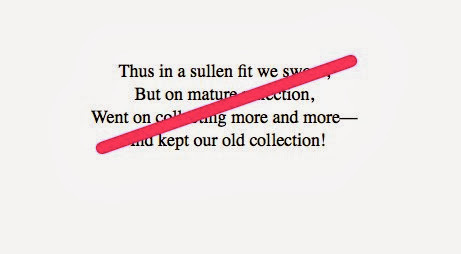 If you look closely, you will see that the last stanza about "collecting more and more" was not part of the original poem! Did Andrew Lang realy give up collecting? I know I read The Library from cover to cover twenty-eight years ago; but that one sentence did not register in my mind. 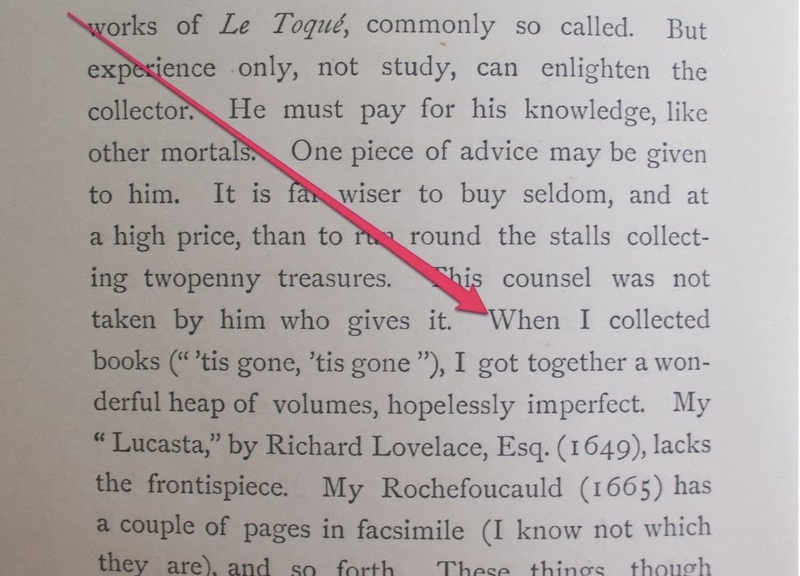 Perhaps I did not want to remember that Andrew Lang, the man whose book inspired me to collect books, had given up collecting himself –– 'Tis gone! 'Tis gone! A few words here about The Library. It was first published in 1881 by Macmillan & Co. in London. The Second Edition of The Library was published by Macmillan in 1892 in London and in New York. In addition to the Preface to the Second Edition, a Postscript was added to enlarge the last chapter on illustrated books by Austin Dobson. 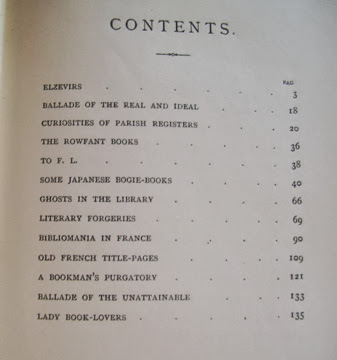 The other chapters about book collecting remained the same as in the 1881 First Edition. I read this book almost twenty-five years ago. 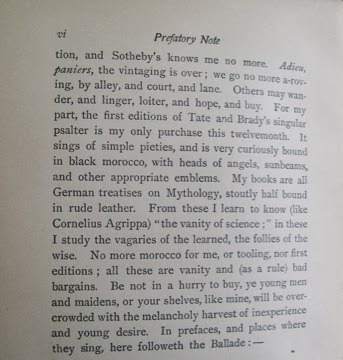 And, recently, I was completely at a loss as to why I couldn't remember reading this prefatory note. Friends and family used to marvel at my excellent memory! Was I losing it? Actually, no. There is a bibliographical maze surrounding the publication of the different editions of Books And Bookmen. It took me hours to comprehend what happened. And it will take more than a few minutes to explain it. 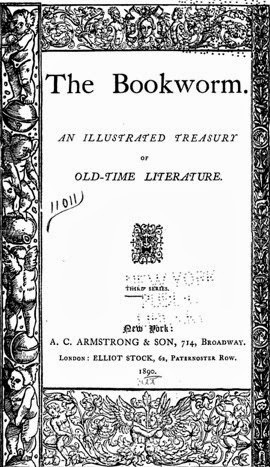 George J. Coombes published both a large paper limited edition of 100 copies and a First American Trade Edition of Books And Bookmen in New York during the early part of 1886. Longmans, Green and Co. published a large paper limited edition of 100 copies of Books And Bookmen in London in 1886 as well. But Longmans, Green and Co. did not publish the First English Trade Edition until 1887. And it published a Second English Trade Edition of Books And Bookmen in 1887 as well. 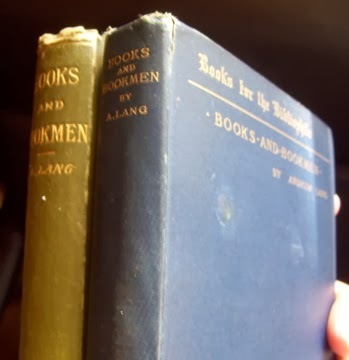 I have both the 1886 First American Trade Edition and the 1887 First English Trade Edition, acquiring both shortly after retiring to Florida and becoming a "man of letters" (mailman) for the United States Postal Service. 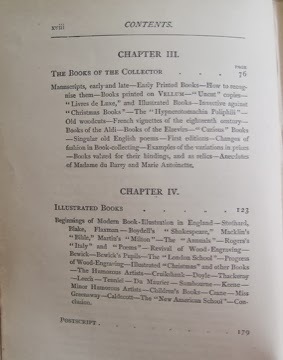 I read the 1887 First English Trade Edition first because it contained five essays that were not published in the 1886 First American Trade Edition. I should also note that the First English Trade Edition of Books And Bookmen did not contain Andrew Lang's swan-song Prefatory Note. 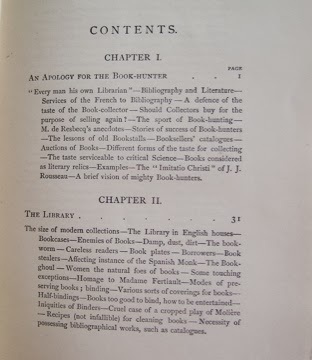 The First American Trade Edition of Books And Bookmen only contained two essays that were not published in the First English Trade Edition. And, when I read it, I went straight to the Table of Contents, and then to the essays themselves, completely bypassing Lang's Prefatory Note. 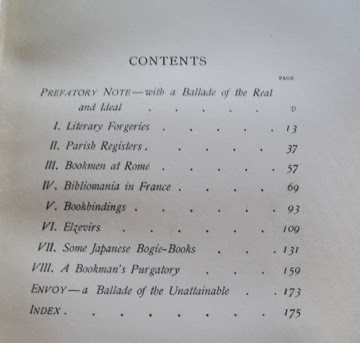 To confuse the matter even further, the Second English Trade Edition of Books And Bookmen, published the same year as the First English Trade Edition, contains two new essays which replaced the essay about Parish Registers. I recently read the two new essays online. I ask you! How could a gentlemen with that much knowledge about books and bookmen give up collecting? 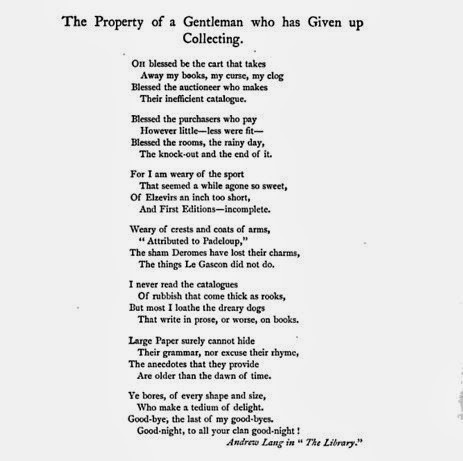 "The Property of a Gentleman Who Has Given Up Collecting" was published at least one more time during Andrew Lang's lifetime; this time in New Collected Rhymes by Andrew Lang, published by Longmans, Green and Co. in 1905. And it contained one new stanza! 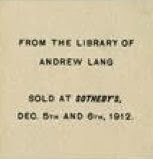 It appears that Andrew Lang finally came to his senses and started collecting again sometime during or before 1905. He died July 20, 1912, and his library was put up for auction at Sotheby's on December 5th and 6th of 1912. I have a small collection of books by and about Andrew Lang, some of which were previously owned by some prominent people. I have yet to acquire a book from Andrew Lang's own library. But, then again, I am not a gentleman who has given up collecting.